When any general card changes orientation, Cheng Yu can discard one card and that player loses one blood. 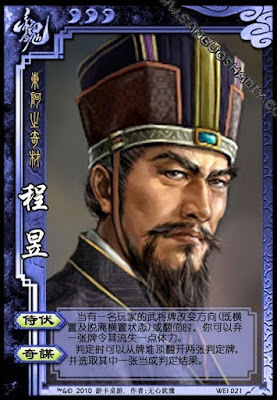 When Cheng Yu does a judgment, he can take the top two cards of the deck. He shows these to everyone and chooses one of them to be his judgment. The other card is discarded. Cheng Yu can cause players to lose blood from Chains and being flipped. In both cases he can hit them both entering and leaving.